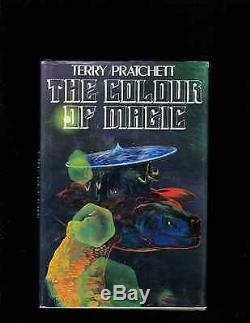 The Colour of Magic by Terry Pratchett. First book in the Disc World Series. Signed by author on title page, inscibed to "Paul" (yes that's me)and includes the authors seal. Martin's Press, , 1983. The author's fourth book and first Discworld novel. Barron (ed), Fantasy Literature 4A-210. Barron (ed), Fantasy and Horror (1999) 7-308. Light edge wear to jacket,, book has small bump at top of spine. FIRST EDITION HB WITH DJ. NICE COPY" is in sale since Thursday, October 13, 2011. This item is in the category "Books\Antiquarian & Collectible". The seller is "bridius" and is located in San Leandro, California. This item can be shipped to United States, Canada, United Kingdom, Denmark, Romania, Slovakia, Bulgaria, Czech republic, Finland, Hungary, Latvia, Lithuania, Malta, Estonia, Australia, Greece, Portugal, Cyprus, Slovenia, Japan, Sweden, South Korea, Indonesia, Taiwan, South africa, Belgium, France, Hong Kong, Ireland, Netherlands, Poland, Spain, Italy, Germany, Austria, Israel, Mexico, New Zealand, Singapore, Norway, Saudi arabia, Ukraine, United arab emirates, Qatar, Kuwait, Bahrain, Croatia, Malaysia, Brazil, Colombia, Panama, Jamaica, Barbados, Bangladesh, Bermuda, Brunei darussalam, Bolivia, Ecuador, Egypt, French guiana, Guernsey, Gibraltar, Guadeloupe, Iceland, Jersey, Jordan, Cambodia, Cayman islands, Liechtenstein, Sri lanka, Luxembourg, Monaco, Macao, Martinique, Maldives, Nicaragua, Oman, Peru, Pakistan, Paraguay, Reunion, Bahamas, Viet nam, Uruguay.